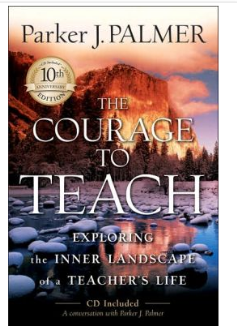 After finishing Rethinking Pedagogy for a Digital Age by Helen Beetham and Rhona Sharpe, that I discussed in my last post, I have moved to a book I have meant to read for years – The Courage to Teach by Parker Palmer. Self confession time. 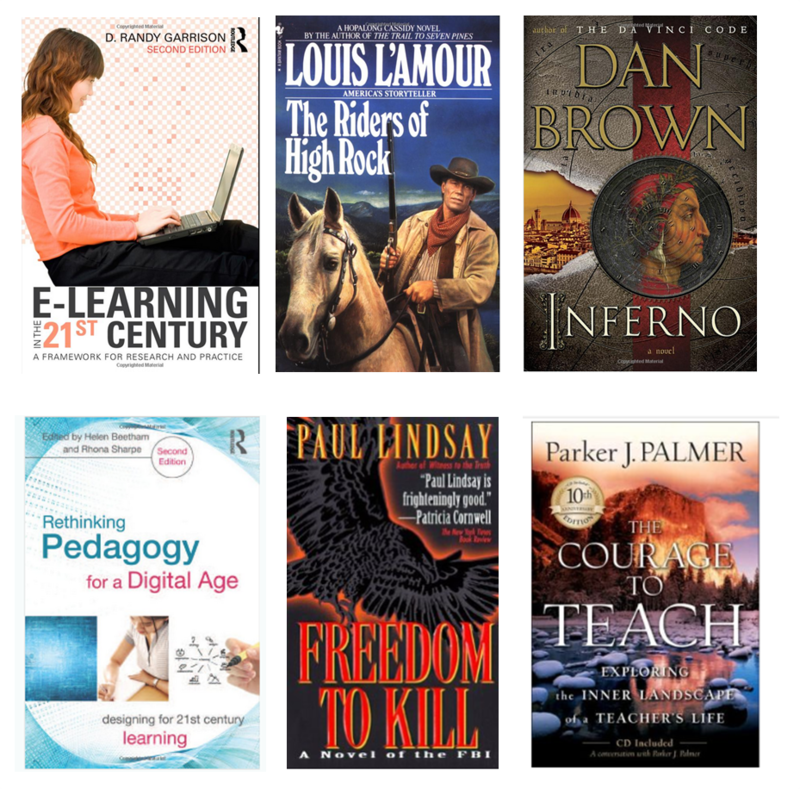 I do read a lot, but not all my books have to do with teaching or elearning. I read a lot of fiction – L’Amour westerns, science fiction, and mysteries … and particularly like old mysteries that I pick up at Goodwill for $3. So between Beetham and Palmer, I read a great little 1997 thriller by Paul Lindsey called Freedom to Kill. It involves the FBI chasing a terrorist (a pre-Nine-Eleven kind of terrorist). Nineteen-Ninety-Seven was only 16 years ago, so the FBI agents did have a laptop, but no WiFi. In fact, tracking emails sent through dial-up modems contributed to cracking the case. When they went on stakeout, they checked out a cellphone so that they would not have to find a payphone. Sixteen years, and how things have changed!!! Maybe that is why I like the old books. I was just starting my educational career in the Nineties…and it was not until my third college that I began carrying a cellphone. So I lived that change! But back to Palmer and The Courage to Teach. I have been wanting to read Palmer’s book for awhile. Many of my colleagues over the past decade have mentioned it. Given that it was originally published in 1997, then updated in 2008, I was interested in how relevant it might now be (or not be) in this digital landscape in which I teach. It sounds to me as if Palmer is writing a book about teaching online! Is not “creating conditions for learning” what we do? In my work with faculty around teaching online, I continually make the point that teaching online is about making connections – connections with students, connections between students, and connections between students and the content – not using tools (though some tools help in making these connections). For a dozen years, I have discussed how I have gotten to know my students’ souls through my online teaching – and “souls” hits the same spiritual notes that Palmer makes. Palmer states early in the book that we as teachers commonly address “what” we are teaching and “how” we are teaching, but less often address “why” we are teaching and “who” we are and how we relate to our students. Good questions for classrooms…whether they are on campus or online. He states that bad teachers distance themselves from their students while good teachers “join self and subject and students in the fabric of life.” This really resonates with me! Online teaching has little to do with distance and everything to do with connections. The learning space should be bounded and open. The learning space should be hospitable and “charged”. The learning space should invite the voice of the individual and the voice of the group. The learning space should honor the “little” stories of the individual and the “big” stories of the disciplines and tradition. The learning space should support solitude and surround it with the resources of the community. The learning space should welcome both silence and speech. His paradoxes have obvious online interpretations. By bounded, he is not suggesting four walls, but rather good questions that keep us focused…but open to multiple paths for discovery. Our online “space” – be it Blackboard or WordPress or Canvas or whatever – should feel safe and open to trusted discourse. Every individual should have the freedom to voice ideas, but collective wisdom should emerge. Our online facilitation should guide the discourse so that themes emerge that paint the big pictures. And a combination of asynchronous and synchronous engagements as well as reflective activities allow for both silence and speech. Palmer makes the case that good teaching is essentially communal. And while he does not go there, this to me suggests the Community of Inquiry model and Garrison’s work (and of course, that was the earlier book I read in June). As I noted in my Rethinking Fundamentals post, I believe that community is still a core concept to good teaching online. It is what good teachers have done for ages … and doing it online is a natural evolution of what we do. The courage to teach and learn in a digital world. I have the good fortune to work with Britt Watwood and extend the conversation (or sometimes inspire) one. Jokingly, I say that I don’t have to blog, I just have to plant the seeds and read Britt’s post. Well, credit to Britt, I did not inspire this post, but it has inspired me. I love the selected quotes, and especially the discussion about “who” we are and how we relate to our students”. Engaging with our students in “social” ways can be tricky, but sharing a enough (our stories) to make students realize that we are human and that we want to be part of a LEARNING COMMUNITY is an important step in teaching by example.